I haven’t read the “On Dublin Street” series, but have a couple of them in my library to be read. So “Moonlight On Nightingale Way” is the first read for me. The beauty is that it can be read stand-alone and I thoroughly enjoyed it. I believe this is the last in the series. And Samantha Young did what she’s so good at, an engrossing and captivating love story for Logan and Grace. Logan is trying to build back his life after a stint in prison, and Grace made sure she has miles of distance between her and her manipulative family. They end up as neighbors and the first sight and talk doesn’t go well between them. Yet there are sparks and instant chemistry. But the past brings a daughter into Logan’s life and turns it upside down and Grace unwittingly ends up in the equation. 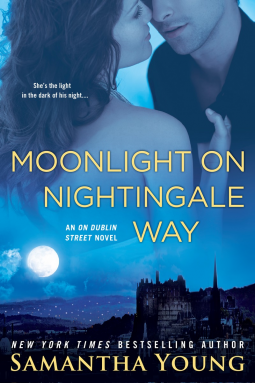 “Moonlight On Nightingale Way” is a captivating read as Logan and Grace try to get past the shadows of the dark. It is a wonderful story of two people standing for what they believe in, that relations are necessarily not made through blood, but can be bond with a heart. With friends and siblings to support, and the promise of a future that can be made, Logan and Grace stand united as Grace finally stands up to her family and Logan becomes a caring and endearing father to his daughter. Samantha Young weaves an emotional story of friendship and support, insecurities and fears, and the strength of love. Received an ARC from Penguin Group Berkley, NAL/Signet Romance DAW via NetGalley for an honest review.